A basic understanding of Laravel is needed to follow this tutorial. We’ll build a very simple app (which I’ll unimaginatively call Chirper) and stuff it with some fake data so we can get moving fast. On the home page of our app, users will see all chirps with the most recent ones first, and they can click a button to Like or Unlike them. Whenever a user likes or unlikes a chirp, the likes count displayed next to the chirp should increment or decrement in every other browser where the page is open. Remember to set your DB_USERNAME and DB_PASSWORD as appropriate for your machine, and to create a database named “Chirper”. Next, we'll set up our data structures. To keep things simple, our app will have just two main entities: users and chirps. Since Laravel already provides us with a User model and migration, we just need to set up the Chirp model and migration. Let's open up our Chirp model and make some changes to it. First, we have to tell Laravel that this model doesn't use the regular timestamps (created_at and updated_at). Then we need to allow its attributes to all be assigned in one go. Lastly, we'll add an accessor so we can easily retrieve the details of the User who posted the chirp. We should see our database tables have been created and filled with fake data. Note: if you run into this error "Specified key was too long; max key length is 767 bytes " when you run migrations, follow these instructions to fix it. Let's set up our home routes and view. In this method we simply retrieve all chirps along with their author details and pass them to the view to render. Lastly, we set up the view, a simple UI that displays a list of chirps, with the author name, time posted and a Like button below it next to the number of likes the chirp has. an onclickhandler for each Like button. a data-chirp-id on each button so we can identify which chirp the button references. an id on each likes_count which includes the chirp’s id so we can easily locate it via document.querySelector. Now visit your homepage at http://localhost:8000 and you should see all the chirps displayed neatly. Now we'll implement the logic for liking and unliking a chirp. The text on the button changes from Like to Unlike. The likes count displayed next to the chirp increases by 1. The text on the button changes from Unlike to Like. The likes count displayed next to the chirp decreases by 1. First, we have two objects containing two methods each, corresponding to the two possible actions. The names of the methods are capitalised so we can easily call them via the text on the button. The first object contains methods to update the likes count displayed below the chirp, while the second contains methods to change the text on the button. We've separated these two functionalities because of our criteria no. 4 above: for a different user viewing this page at the same time, only the likes count should update; the text on the button shouldn't change. 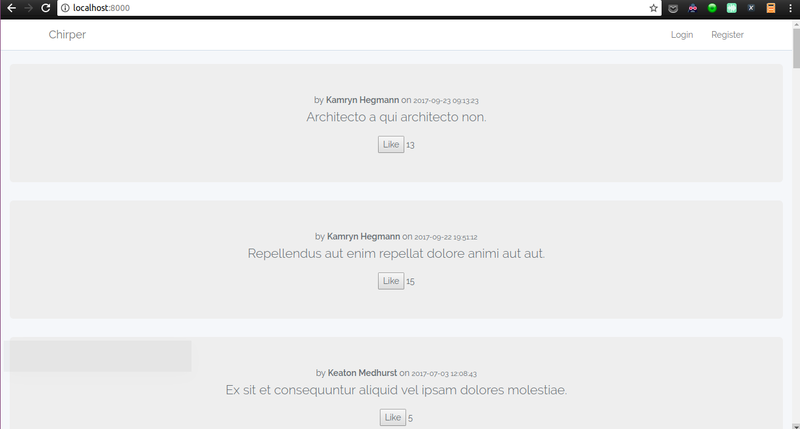 We attach an onclick handler (actOnChirp) to each chirp like button as they are rendered. In this method, we perform the desired actions: change the button text, update the likes count and send the action to the server using Axios, which comes bundled with Laravel. At this point, visiting the home page and clicking the Like button for a chirp works as expected. All good so far. We need to do one more thing when a chirp is liked or unliked is to ensure the likes count shown in every browser on that page shows the newly updated value. We'll do this by broadcasting a new event whenever a chirp is acted on. Pusher gives us the means to do this with their messaging system, and Laravel provides an events and broadcasting system that supports Pusher out of the box. At this point, whenever a chirp is liked or unliked, the event will be fired. But it's only local to the server, so let's fix that by implementing broadcasting to other clients. Create a free Pusher account if you don’t have one already. Then visit your dashboard and create a new app, taking note of your app’s credentials. We’ll need them in a bit. Let’s set things up on the frontend. We'll use Laravel Echo to listen for and respond to broadcasts via Pusher. I've named my channel 'chirp-events', but you can use anything you like. The event variable passed to the function will contain the properties we defined earlier on our ChirpAction event (action and chirpId), so we can simply access them and update the UI for the corresponding chirp. We're logging the event data to our console, just for debugging purposes, so we can see what's going on. Replace the stubs above with your app credentials from your Pusher dashboard. Lastly, add your cluster in the options array of config/broadcasting.``php. After making these changes, you might need to run php artisan config:cache so your changes get persisted from the .env to the config files. We'll also implement a broadcastOn method that returns the channel (or channels) we want our event to be broadcast on. We'll use the same channel name we used on the frontend. Note: If you find an error logged to your console about the WebSocket connection being closed instead, try restarting your browser. Pusher provides each connected tab with an identifier called the socket ID. Whenever a Pusher message is sent containing this id, Pusher knows not to send the message to whichever tab owns that ID. Laravel Echo automatically attaches this socket ID to the request sent by Axios as a header, X-Socket-Id. You can view it by running Echo.socketId() in your console. By using the broadcast...toOthers combo, we're letting Laravel know that it should include the socket ID in its message data, so Pusher can exclude that tab. That's all there is to it. This is just a proof-of-concept to demonstrate how this could be implemented with event broadcasting via Pusher. There are a lot more complex use cases available, so here's your chance to get started building more powerful things with Pusher and Laravel. Let us know what you build in the comments.